For 10 years running, the Arbor Day Foundation has recognized the University of North Texas a Tree Campus USA School for its dedication to campus forestry and tree maintenance. To observe Texas Arbor Day 2018, which is always the first Friday in November, the Grounds department will be planting new trees near the newly constructed track and field complex. Tree Campus USA is a national program that recognizes two- and four-year institutions for promoting impressive forestry and arborist management at their campus. The program was launched in 2008 and UNT has been honored since its founding. 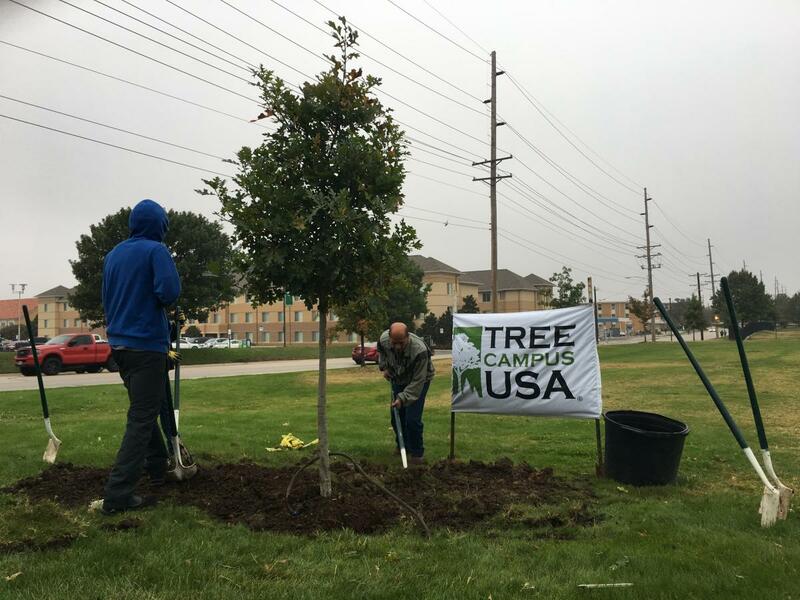 To be considered for this recognition, a campus must meet Tree Campus USA 5 pillars: have a Tree Advisory Committee, a Campus Tree Care Plan, annual expenditures dedicated to tree planting and maintenance, observe Arbor Day and encourage the Service Learning Project. UNT Facilities has a small committee that consists of faculty, staff and community members. This group encourages Grounds members to become Certified Arborists through the Service Learning Project. Kelly Frailey, a facilities technician, said that Grounds spends $3 per student in trees, although it is always more than that amount.